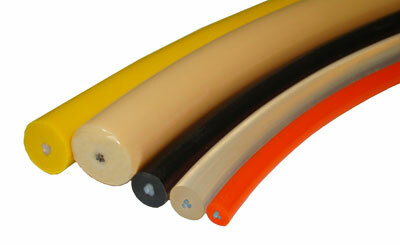 Reinforced Rounthane is extruded round thermoplastic belting with a reinforced core of polyester cord or steel. This versatile product is simple to install and maintain in both conveying and power transmission applications. You won't lose hours of production waiting for steel cable to be braided. With our tool kit, anyone can make a perfect splice in less than 15 minutes...virtually eliminating downtime! And the cables lighter weight makes installations safer too. Urethane can be joined using only a heat paddle. Because of their exceptionally strong reinforcement, Shingle extrusions keep their shape, maintain their tension, and will not stretch even under the stress of heavy loads. That means no surge, les downtime, fewer "knockdowns" and better productivity.